Cannabis dinner parties are now a huge trend across the US. But like cannabis weddings, there is a lot to understand and people are generally new to legal marijuana. There are many things to take into consideration, namely the type of marijuana, the quality, the types of edibles and treats and the décor and design. But once the basics are understood it bears all the resemblance of typical dinner parties. The following are a number ofitems to keep in mind when throwing your own cannabis infused dinner party. Obviously the first thing that needs to be taken into account is the quality of the cannabis itself. What types of dishes will you have, how many and at what levels of THC? 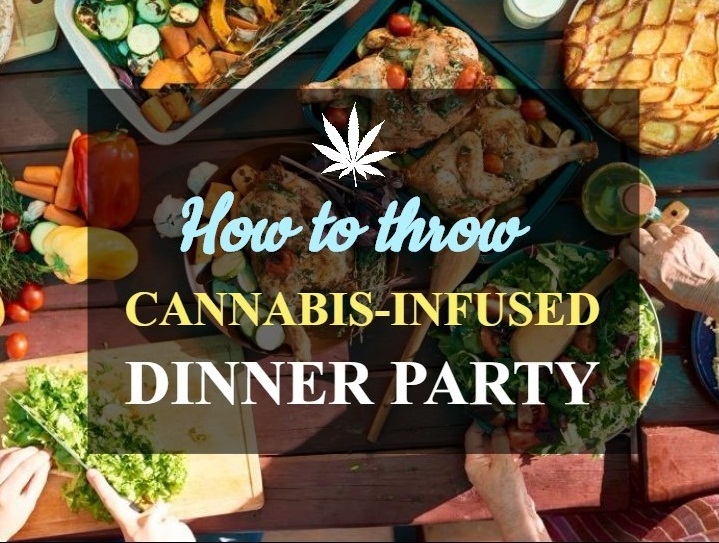 For your first cannabis dinner party keep it as simple as possible. Make a single cannabis infused dish, a top-quality meal that you would be proud to make at any dinner party. Adding cannabis to meals does not add much complexity. It is really just the addition of medicated cannabis oil or butter to the recipe instead of regular oil or butter. For best results make your own cannabis oil, which should take no longer than 25 minutes. Create one high quality cannabis infused dish with some cannabis edibles afterwards. Along with this choose two brands of high quality and popular marijuana strains to smoke afterwards, one Indica and one Sativa. Pair it with a bottle of white and red wine and the evening is set for enjoyment. The food can be chosen to complement the marijuana. Lemon Haze might be a good addition to any dish where you are adding Lemon, while something like Sour Diesel may not go well with any type of edibles, due to its pungent taste and smell. Moderate strains like Blueberry might be a good all-rounder. Blue Dream is also an excellent choice as it is a hybrid that is sativa dominant, providing an uplifting sensation to all participants at the table. This will encourage conversation and interaction, instead of some heavy Indica that will send people to sleep. Remember to keep the infusion levels in the dish moderate and select a strain of marijuana between 12-18% max. There is no need to overdo it and it is better to err on the safe side. You have selected your THC oil, your cannabis edibles and your two brands of marijuana for inhalation afterwards. Know everything about the brands you have selected and why you choose them. Be passionate about it, as your guests will be interested to see why you chose those particular brands. The same goes for the meal itself and the selected wines, as well as the edibles. Everybody loves a theme, and if you pull off a good theme it will make the party. Themes are obviously very creative and individual so you have to come up with them yourself. You could feature a cannabis recipe from every continent for guests to choose from with a theme of global weed for all peoples. Or even an all-natural theme with a weed plant in the center of the table, with some interesting pamphlets surrounding the history of weed and related information. Aside from choosing the cannabis, the theme, the recipe and knowing your stuff, cannabis dinner parties are subject to the same limitations that normal dinner parties are, and much of the same applies. Be careful about your guest list, choose a dish that everybody will enjoy, decorate the dining area with flowers, make the invitations as stylish as possible etc. If you want to go the extra step you can look into weed and wine pairings as this can be quite tasteful if done correctly, and perhaps purchase some hemp menus and hemp products or marijuana themed cushion and linens. The cannabis infused dinner party is limited by your imagination only.